In ancient mythology, the nine muses and Minerva, the Roman goddess of wisdom, are often depicted with rosemary in their hands. Carried by wedding couples as a sign of love and fidelity, rosemary is also a symbol of friendship and loyalty. Through the ages, this aromatic herb has been linked with memory and remembrance. In ancient times, a sprig was often placed in the coffin to ensure that the deceased would not be forgotten. In the Middle Ages, it was common to keep some sprigs under the pillow to chase away bad dreams. Additionally, rosemary was used in purification rites and was known for its therapeutic qualities. The ancients believed that when used in moderation, rosemary could be a great digestive tonic and anti-inflammatory booster. To this day, this herb’s refreshing scent makes it a popular element in various health and beauty products. In Italy you will find as many herbalist shops as you will pharmacies. Italians have been using natural cures and herbal teas for thousands of years. A herbalist must have a special degree in order to prescribe herbal remedies. Herbalists say that rosemary aids in blood circulation and helps fight against fragile capillaries, but it is not recommended for those with high blood pressure. In addition to its long and colorful legacy, rosemary has been an important ingredient of Mediterranean cuisine for centuries. Rosemary growing wild in the Italian countryside. A perennial plant from the Lamiaceae family, rosmarino is a familiar sight in the Italian countryside, growing in the wild throughout Italy and the rest of the Mediterranean regions. The botanical name, Rosmarinus officinalis, is derived from the old Latin term meaning “dew of the sea,” probably referring to its pale blue flowers and the fact that it often grows near the sea. The fresh leaves – thin, spiky, evergreen needles – have a particularly potent fragrance and flavor. 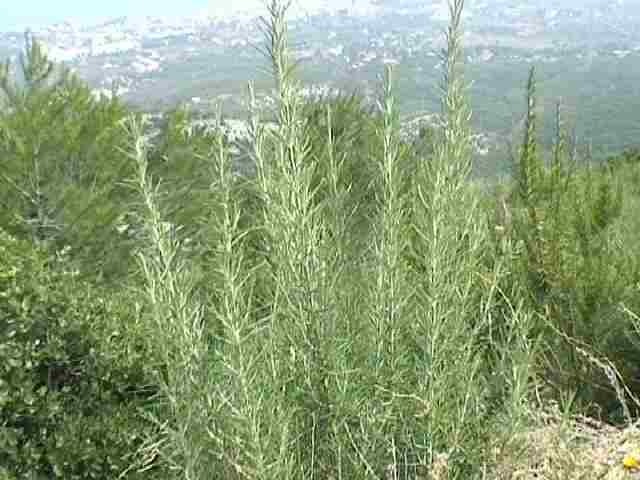 In Italy, rosemary is predominantly used to flavor roasted and grilled meats, poultry and fish. It is often coupled with garlic, wine and vinegar. When grilling, it’s a great idea to first marinate the meat in rosemary, sage, bay leaves, thyme, pepper and olive oil; then, just prior to cooking, sprinkle rosemary leaves and branches directly on the hot charcoal or in a grill box for a gas grill. The wonderful aroma of the burning herb will permeate whatever you are grilling. Rosemary is often used in vegetable preparations – particularly, roasted potatoes and mushrooms. Cannellini beans are also enhanced by this herb. Rosemary is one of the five herbs comprising a bouquet garni – the bundle of fresh herbs used in stocks and stews. Unlike many other aromatic herbs, rosemary does not lose its flavor by long cooking. Another notable use of rosemary – alone or with other herbs – is to flavor olive oil. Fresh rosemary is now available at most grocery stores. You’ll often see it in packages of 4- to 5-inch sprigs or as bundles of long, straight branches. Be sure the leaves look fresh, green and pliable, not dry, brittle or blackened. Store rosemary in the refrigerator wrapped in a damp dishtowel for up to one week. Homemade infused oils are a great way to add an extra shot of flavor to your cooking, salads and marinades. They make perfect gifts for food lovers and serious cooks. Good flavorings to use include fresh herbs, garlic, whole spices, pink peppercorns or dried chilies. Infused oils have the potential to support the growth of bacteria, so you should follow the procedures for bottling flavored oils carefully and make sure that any ingredients you use are washed and thoroughly dried first. Use pretty recycled bottles or jars for these oils. It’s important to sterilize all bottles or jars and their lids before adding any ingredients. The dishwasher does a great job or after hand washing, place them upside down in a cold oven and heat the oven to 300 degrees F. Leave the bottles in the oven for 10–15 minutes. Place them upside down on a clean cloth until you are ready to use them, so dust or dirt, which could contaminate the oils, can’t be trapped inside. Alternatively, you can boil the bottles in a large saucepan covered with water for 15 minutes, dry them thoroughly with a fresh clean cloth and turn them upside down on another cloth until they are ready to be used. Make the flavored oil a week before you want to give it as a gift. For rosemary oil, bruise a large sprig of fresh rosemary with the end of a rolling pin. For lemon oil use 3-4 large ribbons of lemon peel and for chili oil use 3-4 whole chilies cut in half lengthwise. Put your choice of dry ingredients into a clear, sterilized glass bottle (at least 2 cups in capacity) and add 2 cups of light olive oil. Make sure the dry ingredients stay below the surface of the oil or they may turn moldy. Secure the lid firmly and shake well once a day for a week to allow the flavors to develop. Add a gift label with instructions to store the oil in the refrigerator and use within a week. Mix the water and olive oil with the dry yeast (you’re looking to dissolve the yeast) in a medium bowl or measuring cup. Thoroughly mix the remaining dry ingredients in the bowl of an electric mixer and add the yeast mixture. With the paddle attachment mix for 2-3 minutes. Switch to the dough hook and knead the dough for 5 minutes; you’re looking for a fluffy/not too dense dough. Form the dough into a ball and coat the exterior with a bit of olive oil and place in a large bowl, covering the bowl with a kitchen towel. The dough should rest 30-45 minutes or until it doubles in size. Add one tablespoon of olive oil to a 10 by 15 inch cookie sheet and thoroughly coat the bottom with the oil. Stretch the dough on your cookie sheet (you’re looking for a thickness of about 3/4 of an inch). Next, create dimples in the dough with your fingertips and drizzle a bit more olive on the dough. Next, add fresh rosemary and sea salt and crushed red pepper flakes. Preheat the oven to 400 degrees F. and bake the focaccia for 20-25 minutes, depending on how thin or thick your dough is. You’re looking for a golden brown top and a somewhat crunchy bottom. Using 5 tablespoons of broth, saute onion, carrot and celery in large soup pot over medium low heat for 5 minutes, stirring frequently. Add the rest of the chicken or vegetable broth, the kale and tomatoes. Add beans, herbs, salt and pepper. Cook for several minutes, so beans can heat through. These potatoes start out looking very wet, but the mixture cooks down to leave the potatoes crisp and tangy. Heat the oven to 400°F. In a large mixing bowl, whisk together the mustard, olive oil, vermouth, garlic, rosemary, salt and pepper. Add the potatoes and toss to coat. Pour the potatoes onto a large rimmed baking sheet and spread them out in a single layer. Roast, tossing with a spatula a few times, until the potatoes are brown on the outside and tender, 50 to 55 minutes. Serve hot. Roasted in an herb-infused oil, the shrimp turn pink and fragrant in just a few minutes minutes. Pour the oil into a 9×13-inch baking dish. Add the thyme, rosemary and black and red pepper and bake until the oil mixture is fragrant, about 10 minutes. Add the shrimp to the dish and toss with tongs until coated. Bake the shrimp until just pink and firm, 7-8 minutes. Add the vinegar and 1/2 teaspoon salt, toss well, and let rest at room temperature until the oil cools slightly, about 5 minutes and serve. Serve the shrimp with rice and sautéed broccoli raab. Heat oven to 350 degrees F. Using a sharp knife, cut about a dozen slits all over the pork, making some deep and some shallow. Finely chop rosemary leaves and garlic together. Transfer to a small bowl and stir in some salt and pepper. Drizzle mixture with a little olive oil to hold the rosemary and garlic together. Using your fingertip, insert a small amount of mixture into each slit in the pork, pushing mixture to the bottom of each slit. Place the butter in a shallow roasting pan and put it into the oven to melt; spread butter around pan evenly. Sprinkle the coarsely chopped onion over the melted butter. Place the pork loin directly on top of the onions; do not use a roasting rack. Drizzle a small amount of olive oil over the pork and add wine to the pan. Roast, uncovered, basting with the wine about every 20 minutes for 1 hour and 45 minutes or until an instant read thermometer reaches an internal temperature of 145 degrees. Transfer the pork to a carving board and let rest 10-15 minutes before carving. Basting the chicken with lemon juice while it’s on the grill gives it a tangy taste. For the marinade, steeping the rosemary in hot water intensifies the flavor of the herb. Heat grill to medium. In a small saucepan, bring 1/3 cup water and rosemary to a boil; remove from heat, cover and let steep 5 minutes. Transfer to a blender. Add oil and garlic; season with salt and pepper. Puree until smooth; let cool. Combine chicken and pureed rosemary oil in a shallow dish or resealable plastic bag and turn to coat. Cover and let marinate at least 15 minutes at room temperature or overnight in the refrigerator, turning chicken occasionally. Remove chicken from marinade; place on grill. Discard marinade. Cook, basting frequently with lemon juice and turning as needed to prevent burning, until cooked throughout, 20 to 30 minutes. All these recipes sound delicious. Rosemary is so versatile and we’re lucky it’s evergreen too. Thank you so much. I love that it lasts all winter on my patio, It is the one herb I can always count on being there. very informative post with lots of great recipe ideas! thank you for sharing.. ps i love foccacia! Same here and since I don’t use pesticides, my herbs don’t always last-with one exception rosemary. Thank you for your comments.